We have been playing around with a web based alternative to Windows Movie Maker and iMovie. The application is called Wevideo. It is powerful, versatile and free. This program will not do chroma key work yet and doesn't allow you to split clips, but apart from that it is a very complete toolset for video production work. We just have begun using it with our students for video work that can't be done in our Mac Lab, due to booking issues. It will be presented to 7th grade Humanities students as one of several options for tools they can use when producing their slave diary projects this fall. 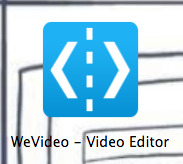 If you haven't tried Wevideo yet, you should. Here is a brief tutorial on how to use this free, online application for movie making.